Masses of pink flowers on arching stems Kolkwitzia amabilis (syn Linnaea amabilis) is a standout in the garden border when in full flower. 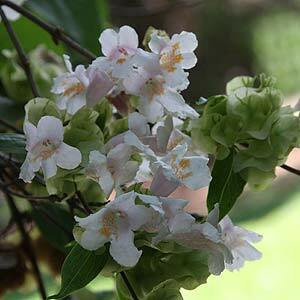 Kolkwitzia amabilis or ‘Beauty Bush’ are a deciduous shrub that will grow up 3-4m. Prolific flowers during spring with clouds of pink flowers covering the bush. When in flower bees and butterflies are attracted as well as nectar seeking birds. This is a suckering deciduous shrub that will form a clump over time. Useful in that it will flower well in full sun to light shade and is easy to prune. A few named cultivars are available including K. amabilis ‘Pink Cloud’, lighter pink flowers than the species and great light green foliage. Kolkwitzia amabilis is originally from China (Chinese Beauty Bush) and does best in full sun however it will tolerate part shade. Kolkwitzia amablilis grow well in a moist soil humus rich deep soil. As it is both drought and cold tolerant, it is perhaps underused in Australian gardens.